Reporting and analytics are key to any social strategy. Whether it’s reviewing content relevancy, looking at your share of voice or tracking your audience engagement, data helps your brand make smarter decisions on social. Of all the social networks, Facebook arguably gives you the most amount of data to work with. And sometimes sorting through all those reports, particularly if you have multiple profiles, can be overwhelming. Let Sprout help! Want to follow along? 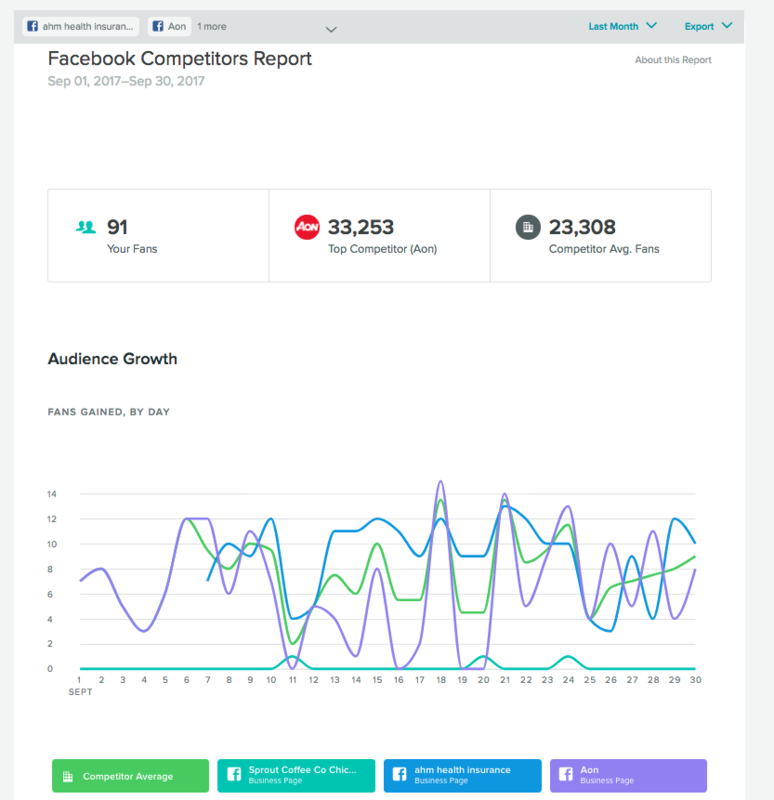 Sign up for a free trial and dig into your brand’s own Facebook reports. The number of paid and organic likes for your Page over a specific period of time. Your top performing Facebook posts, and how your content has been shared including reach, likes, comments and so on. 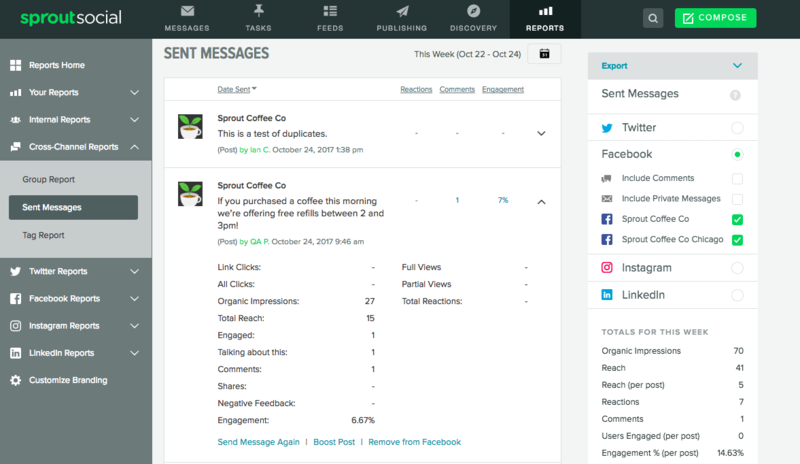 You can drill down into the data with the Sent Messages report, which we’ll talk about a little later. A glimpse at how your content is traveling across Facebook by looking at how information is shared. This includes the number of stories (comments, mentions, posts, etc.) created and the number of users posting your content. Audience demographics, such as the age, gender and location of your fans. You’ll also see which demographic engages with your content the most. Keep in mind, this report can only be run for Pages with 30 or more fans or followers. 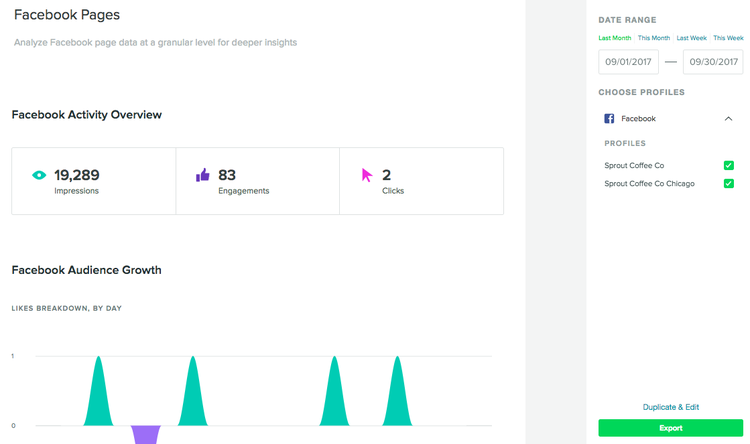 What this section shows you: A general overview of of impressions, engagement and link clicks for your page during your selected period of time. Why it’s important: It gives you a high level view of your page performance. This is great for a quick view of your page’s engagement during a specific month, quarter or any other length of time. What this section shows you: How many paid and organic likes your page has received over your selected period of time. Why it’s important: It’s crucial to know whether or not your audience is growing or shrinking. The “Net Likes” metric is where you’ll really want to focus. Getting 100 new followers isn’t as valuable if you had 50 unlikes over the same period of time. When your number of unlikes outpaces your new likes, it’s a sign your fans aren’t engaged. Follow these tips to improve Facebook engagement and keep your followers around. What this section shows you: How many times you publish per day on Facebook, as well as the type of content you share. Why it’s important: With the Facebook algorithm slashing organic reach for brands, you constantly have to test different publishing cadences to get as much exposure as possible. With this report, you can see how often you currently publish each day. 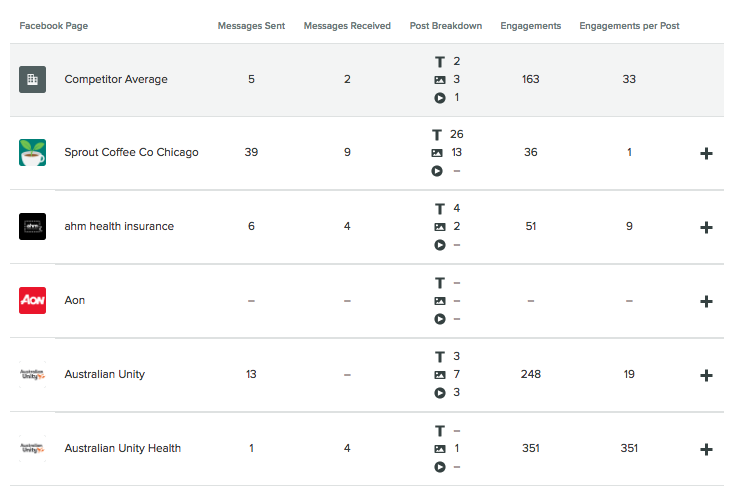 To get the most from this data, compare it against your impressions and engagement data to see if there’s a correlation between publishing behavior and engagement. What this section shows you: Your top five performing Facebook posts. 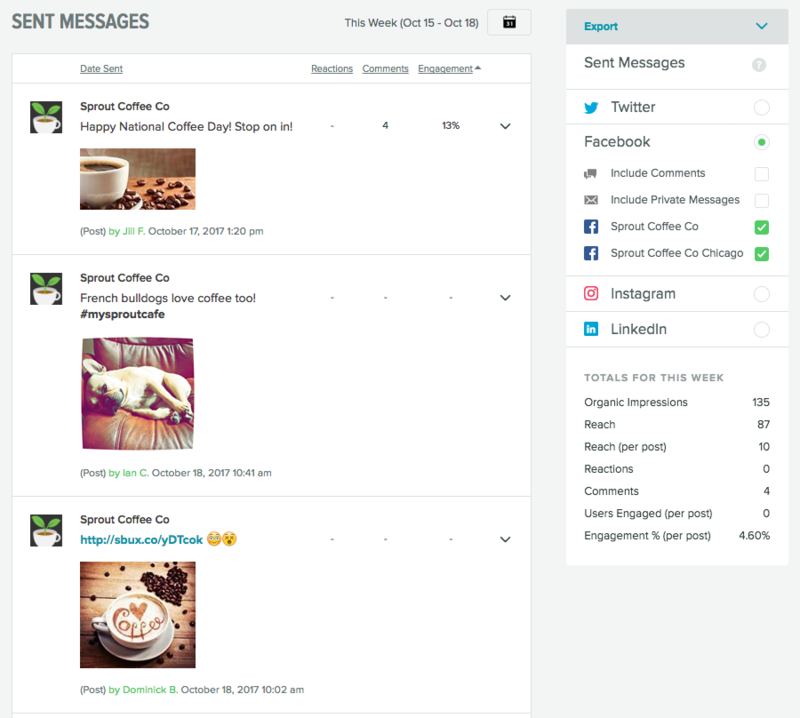 You can sort them by reactions, comments, engagement or reach. 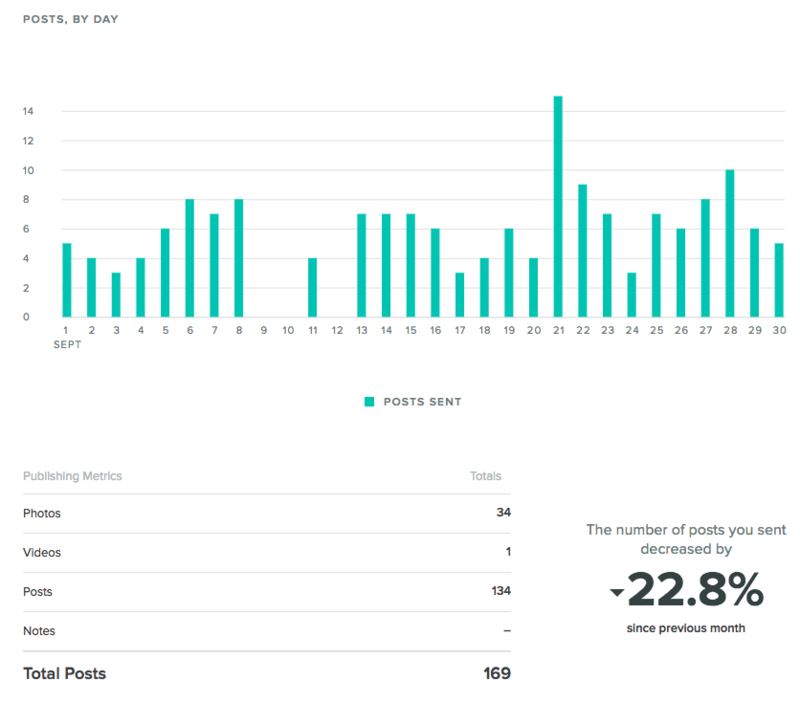 Why it’s important: Once you know your most engaging posts, you can analyze why they worked. It could be the copy, your image or maybe the time you posted. Find why the content resonated then try to replicate it with future posts. What this section shows you: The number of impressions your content has received on Facebook as well as the users reached. The users reached metric includes the number of users that were served any content associated with your Page via the News Feed, ticker or visits to your Page. Paid impressions: The number of impressions of Sponsored Stories or Ads pointing to your page. Organic impressions: The number of times any organic content associated with your Page was seen in News Feed, ticker or on visits to your Page. 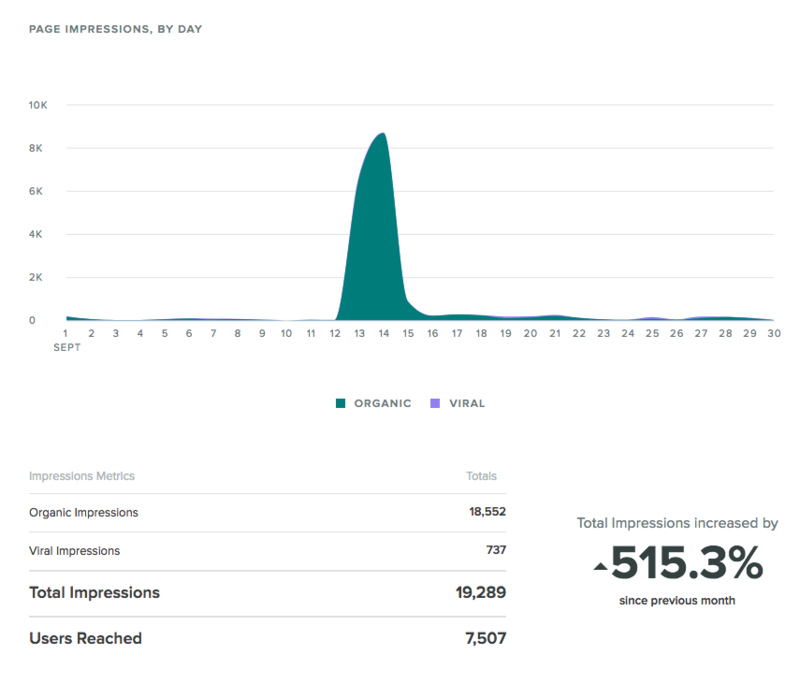 Viral impressions: The number of times any organic content associated with your Page was shared by third parties, and subsequently generated impressions of your Page. Why it’s important: If you dedicate time and resources into creating and sharing content on Facebook, you probably want to get it in front of as many people as possible. This report helps you visualize how many people you’re reaching. If you see negative trends, look into what the potential problem could be. If you see a sudden spike, check the content you shared that day to understand what went well. What this section shows you: How well your video content performs on Facebook. You can see how many people watch your full videos, paid vs. organic views and more. Note, this is only available if your brand publishes videos. Why it’s important: Facebook video is more prevalent than ever. In fact, 45% of people watch more than an hour of Facebook or YouTube videos a week. So needless to say, it’s well worth it to invest in Facebook videos. But just sharing a video doesn’t guarantee success. You need to measure how your videos actually perform so you can optimize your strategy for success. What this section shows you: How much engagement your Facebook posts receive each day broken down by reactions, comments and shares. Why it’s important: Engagement is one of the most important metrics for your Facebook efforts and a key factor in Facebook’s ranking algorithm. If you want your posts to get more organic visibility, you need people to engage with your posts. 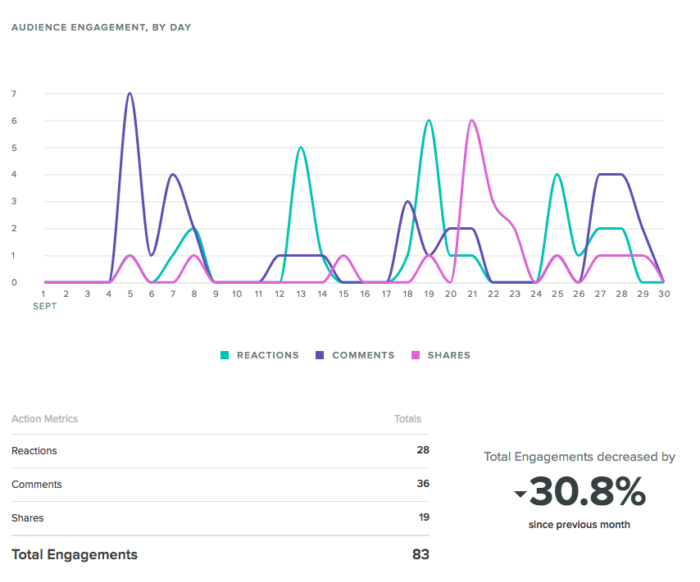 Similar to what we mentioned about impressions, look for dips or spikes in your engagement. Then you can look deeper into what happened on those specific days. What this section tells you: Details about your audience. 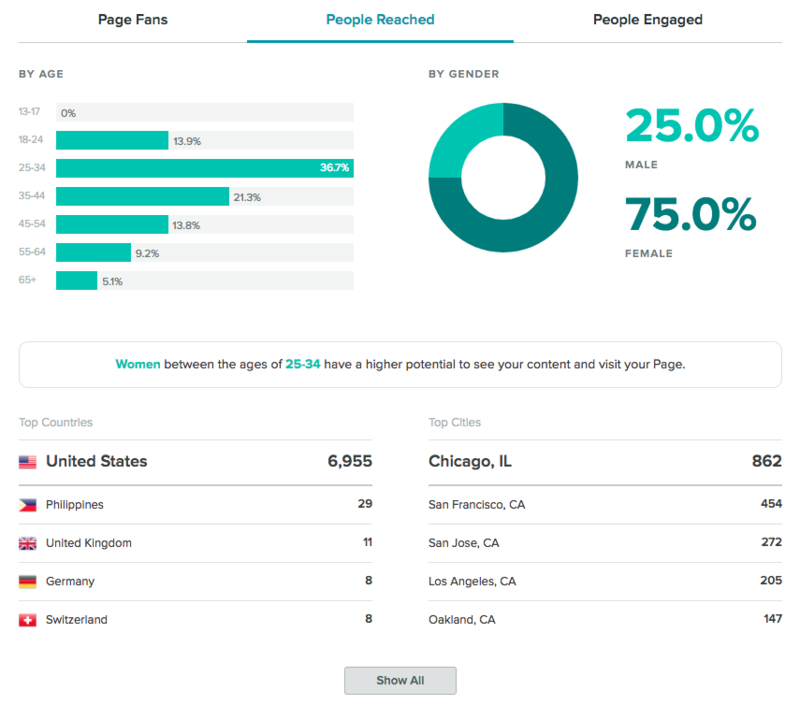 In addition to seeing your total audience, you can also break down your demographics based on the people you reach and your most engaged users. It’s broken down by age, gender and location. Why it’s important: Once you know your audience, you can tailor your content to resonate with them. For instance, the content you show 55-64 year old men in Germany will probably be different than what you show 18-24 year old women in the US. Once you’ve identified your target audience, you can use Sprout’s audience targeting feature to share your posts with specific segments of your audience. What this section shows: A performance comparison across the different Facebook pages you manage. Why it’s important: If you manage multiple pages, you can benchmark and compare your performance across all of them. It’ll indicate audience size and growth, how often you post, impressions and engagement. If one of your pages is significantly outperforming the others, you can dig into the data to understand why. Do you post more frequently? Do you share more videos? Use this section as a starting point to benchmark your performance across your pages. While the Facebook Pages report helps you understand overall Page performance, the Sent Messages report helps you understand the performance of individual Facebook posts. Date sent: The date and time your message was sent. Reactions, comments and engagement: The number of reactions or comments the post received and its engagement rate. 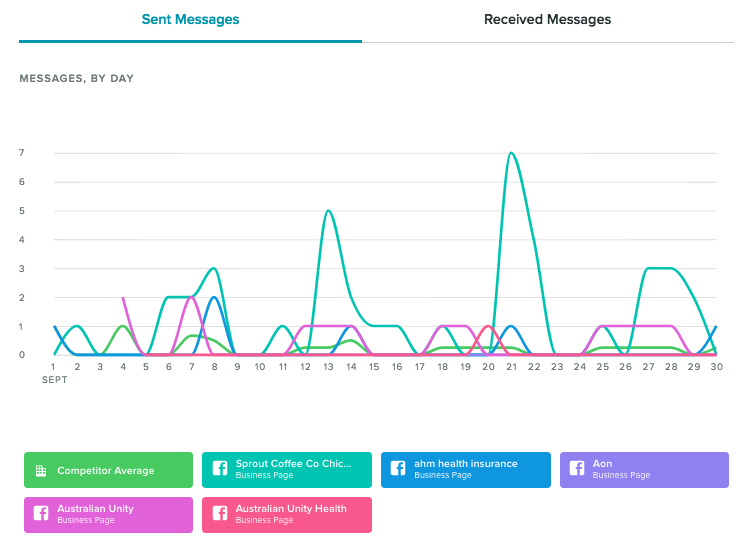 You can sort your sent messages by any of these metrics. Comments and private messages: The filter on the right-hand side allows you to include comments or private messages in your report. 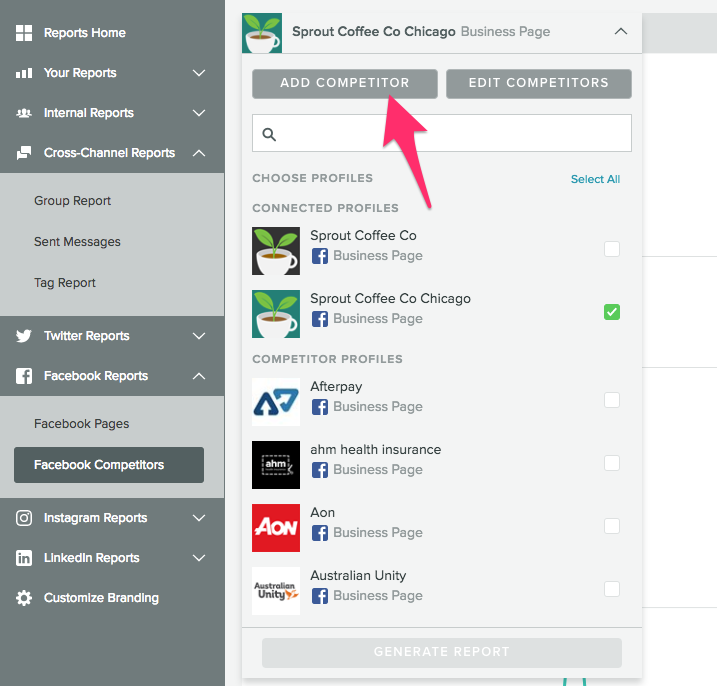 Pages: You can also select which specific pages you want to include in your report. 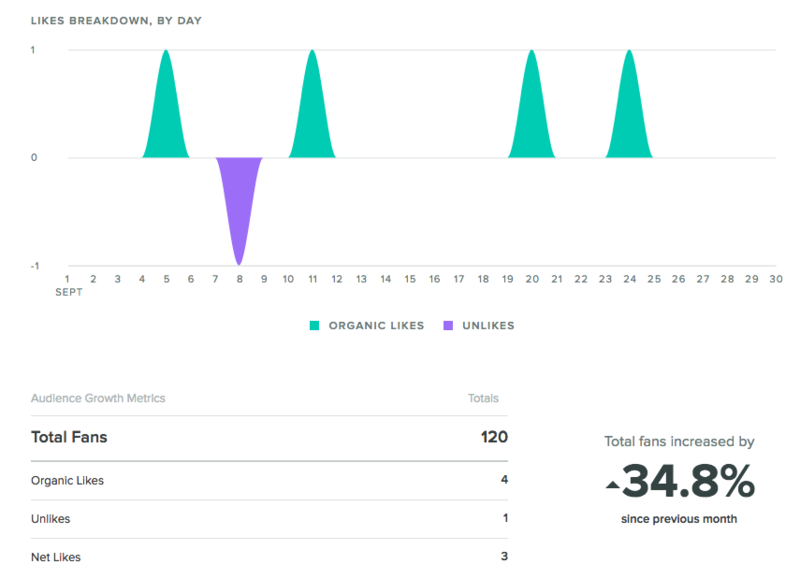 Totals: This gives you an overview of the total impressions, reach, reactions, comments and engagement metrics over your selected period of time. Export: You can export your report as a PDF or CSV file, as well as email it to clients or other team members. You can even schedule a delivery for the report if you want it to be sent out on a regular basis. The Facebook Competitors Report gives your brand the ability to track key metrics for any Facebook page, and benchmark their performance against your own. Whether you want to see how you stack up against the competition or just want to keep your finger on the pulse of other brands in your industry, our Facebook Competitors Report will give you the intel you need to make more informed decisions. This report is available for Professional and above plans. There are a few different sections within this report that’ll give you insights into what you competitors are doing, and how much success they’re seeing from their efforts. The first thing you’ll see is an overview of your audience compared to your competitors. It shows which competitor has the most fans, as well as the average number of fans across all your competitors. This allows you to see how your audience size stacks up against the competition. Knowing the size of your audience is nice, but it’s also important to understand how quickly (or slowly) your audience grows. With the Facebook Competitors report, you can see how your audience growth compares to other brands. Are they growing faster than you? Did one of them get a sudden spike in fans over the weekend? How many new fans do other brands get every day? This report will help you answer these types of questions so you can better judge whether or not your own audience is growing at a reasonable rate. Typically you end up blindly guessing how many times you should post each day, or you might not have a posting cadence at all. The Message Volumes section of this Facebook report will help shed some light on your posting schedule. You’ll see how many times your competitors post per day, as well as the number of comments and public stories each page receives. Again, this is extremely valuable for benchmarking your data. But additionally, it’ll give you an idea of whether or not your posting frequency is too high or low. For instance, if you publish once a day on average, but your competitors tend to publish at least three times per day and have more engagement, it could be a sign you need to share more content to compete. 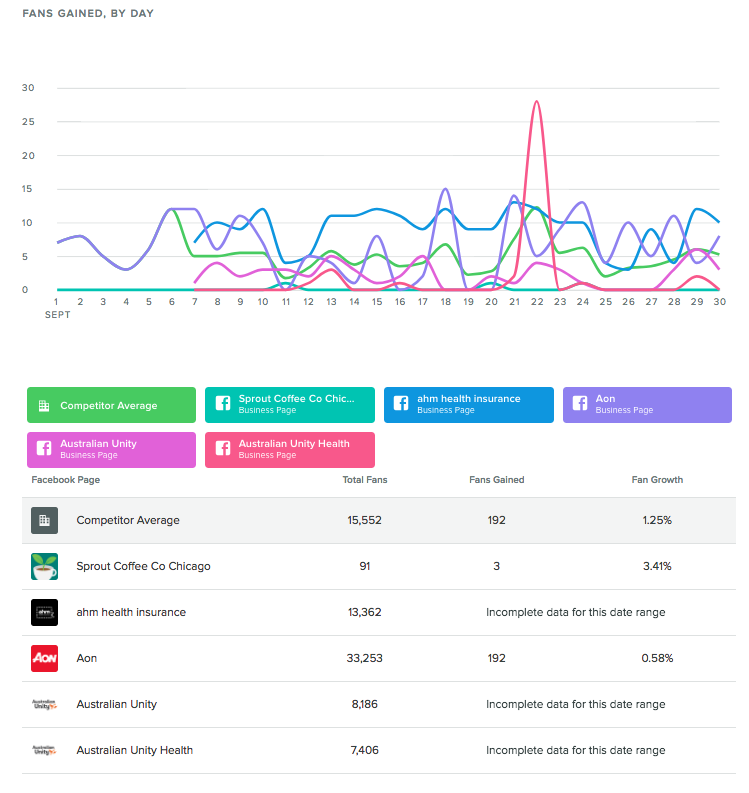 This section of the Facebook Competitors report gives you a breakdown of publishing and engagement metrics for you and your selected competitors. One area in particular that’s interesting is the Post Breakdown column. Do your competitors primarily publish videos, photos or standard text posts? Look for correlations between the type of content they share and their engagement. 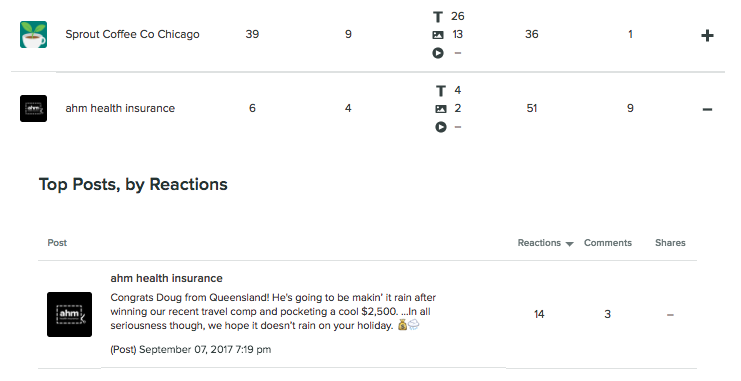 You can also click on the + icon to expand the data for any of your competitors to see their top five posts over your selected time period. Want more flexibility over what you show on your Facebook reports? Whether you want to prove the value of your Facebook efforts to clients or you just want show your CMO the data they care about the most, our Report Builder makes it extremely simple. The Report Builder is available for Agency Partner Program participants and is included with Sprout’s Advanced plan as well. Analyze the impact of your published content. Make smarter decisions on how to increase your social media presence. Follow-up on the results of your work—visualize how these changes in your social strategy translated into responses among your followers and fans. 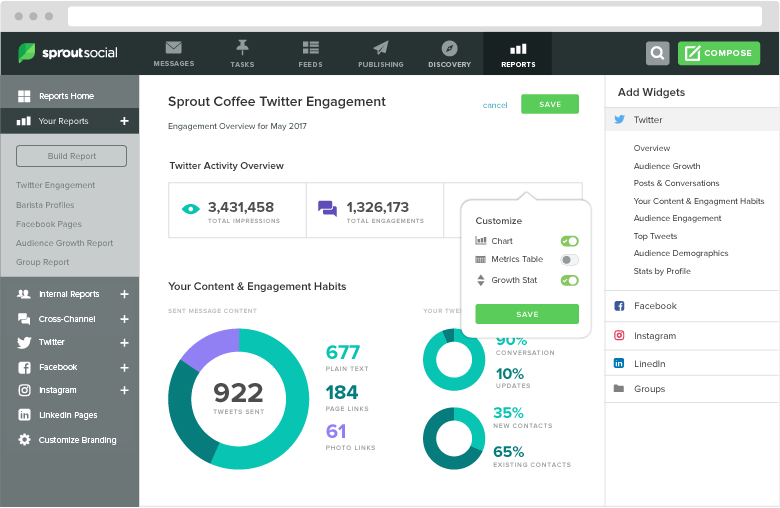 Learn more about Sprout Social’s Facebook management tools and additional features here.